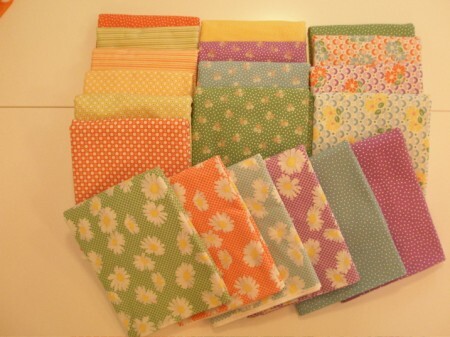 My new fabric line has arrived. Yeah! This is my first line with Timeless Treasures Fabrics, and I’m soooooo pleased with it. The colors came out just like I wanted. I’ve been designing 1930′s repro prints for a while now, and with this line we’ve gone a little more hip with the colors. They’ll still work for those people who want to recreate the look of vintage quilts, but they are also young and fun and chic! The blue is a little bit dusty, the orange is true (that’s me, true to my orange! ), the green is a little bit apple-y, the purple not too red and not too blue and the yellow is sharp and crisp. I’d love to know what you think of the colors. As always, I’ve done a panel, but this time, it’s not blocks or a wall hanging, it’s an apron panel – the Saucy Circle Apron! 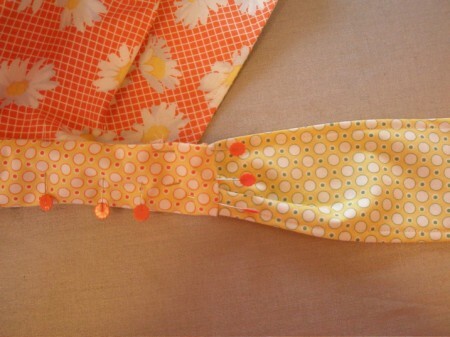 Circle aprons are so flattering, and I think this one is adorable, although while I was trying to arrange the ties for the photo, I kept getting images of the Trix bunny in my head! 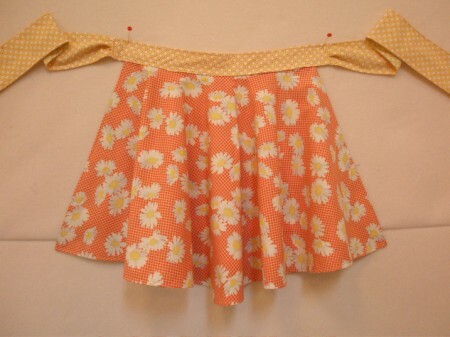 It’s done with the Daisy May print and has the Duo Dot for the apron strings. 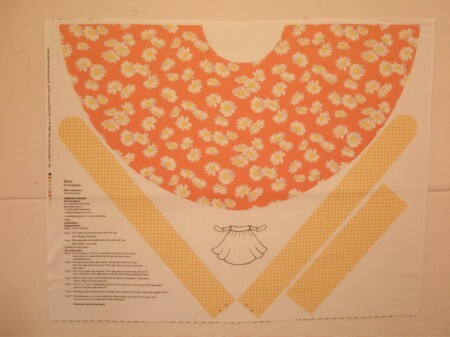 You can make this apron from the pre-printed panel. 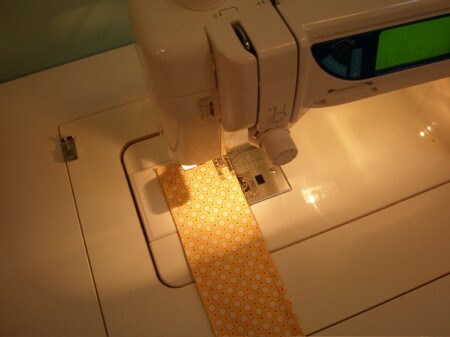 All you need is a little piece of fusible interfacing for the waist band, and everything else is printed right on the fabric – including the instructions! 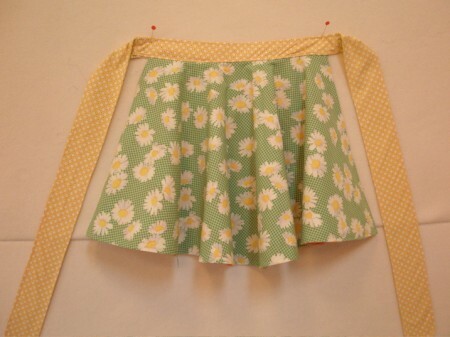 If you want to make it reversible, you can buy two panels or an extra yard of fabric and have two aprons in one! It took me just an hour and a half to stitch this one up. Here are some photos I took along the way. 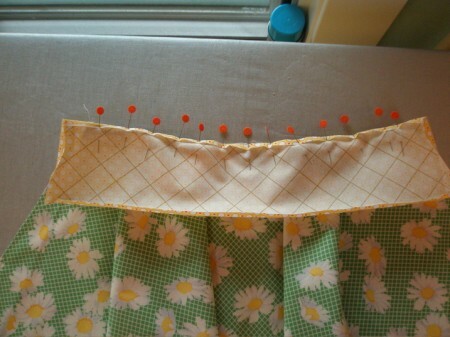 I used one panel of orange and one of green, stitched them together, turned them right-sides-out and top-stitched. Once that’s stitched on, it’s just a matter of flipping it over to the other side and stitching again. More pins, please. Almost finished! 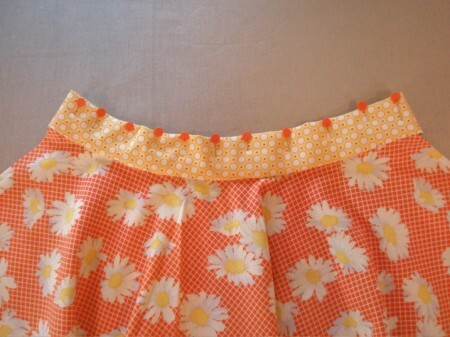 It’s just a matter of slipping the apron stings in the end of the waistband and top stitching everything. Wasn’t that easy! 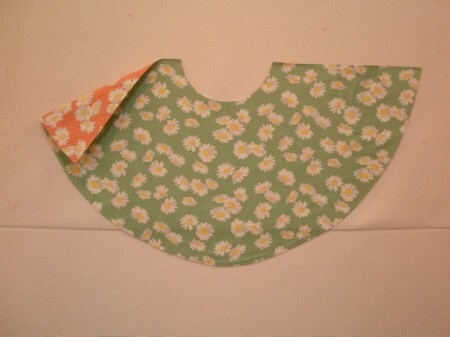 If you’ve been thinking of having a handmade Christmas, think about a few Saucy Circle Aprons!